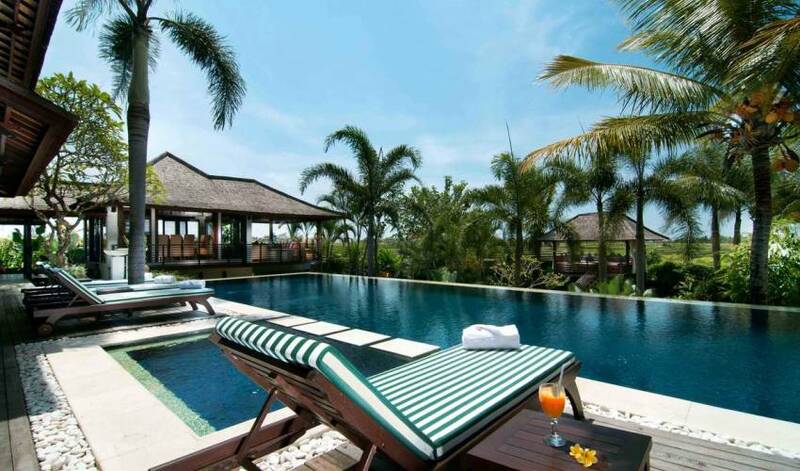 Welcome to Villa 375, 5-bedroom villa completely surrounded by rice paddies, the villa was meticulously designed with an eye for modern, tropical elegance. 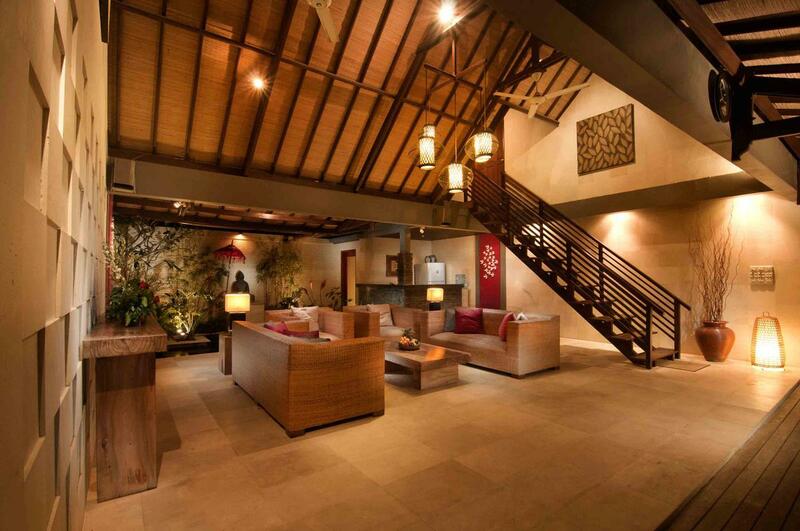 White Palimanan stone walls and rich Merbau wooden floors were chosen for each room to fuse the dignified tranquility of a temple with earthy warmth. 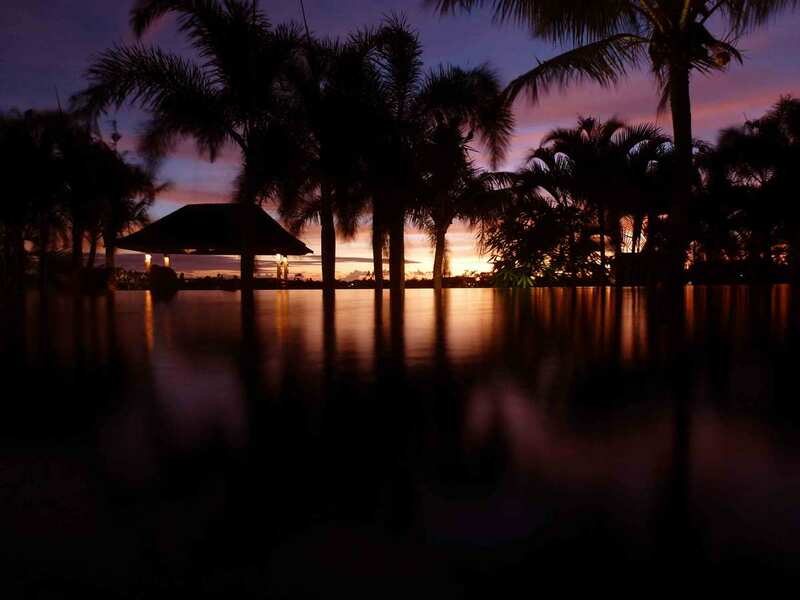 It's gardens feature an array of exotic trees and plants carefully selected and nurtured to honor the spirit of the island's renowned beauty. 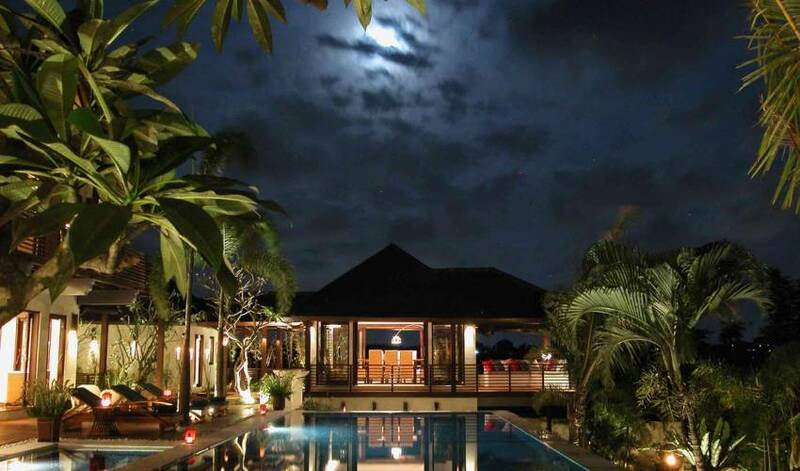 The villa is as ideal for solitude and relaxation as it is for parties or other social functions. 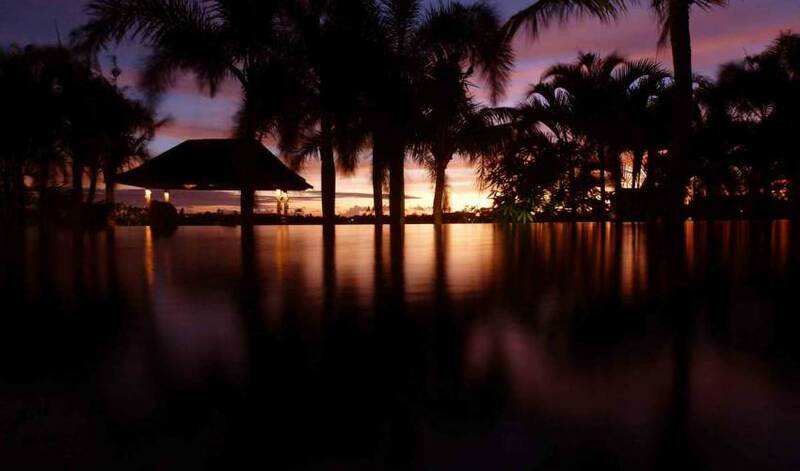 Set around a five-by-17-meter infinity pool, each of the villas bedrooms has a spectacular view. 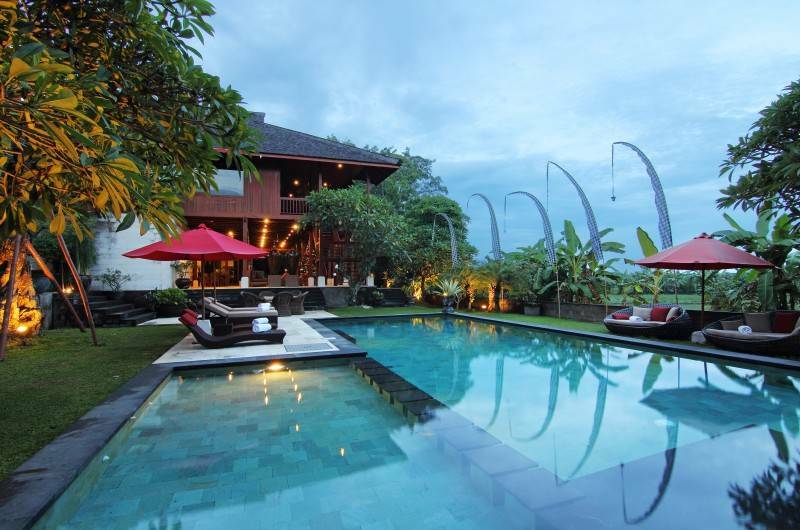 The villa has an open-air living room with a sound system and equipped bar. Other common areas include a fitness room, a detached viewing platform ideal for morning meditation or yoga as well as late afternoon cocktails, and a detached dining area surrounded by balconies. 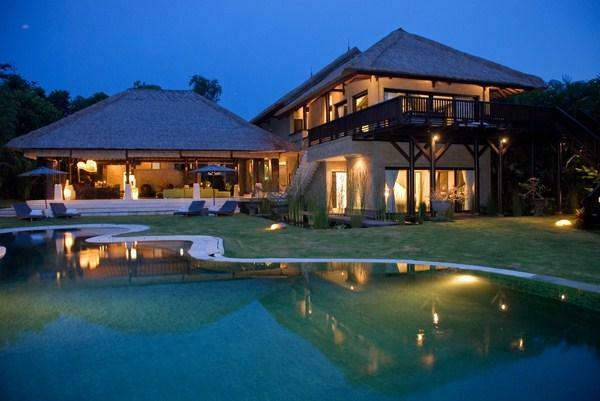 It has an air-conditioned TV room and has a full bathroom so that it can be used as a fifth bedroom if needed. The villa also has a fully appointed kitchen with staff quarters and a parking area with a security post. 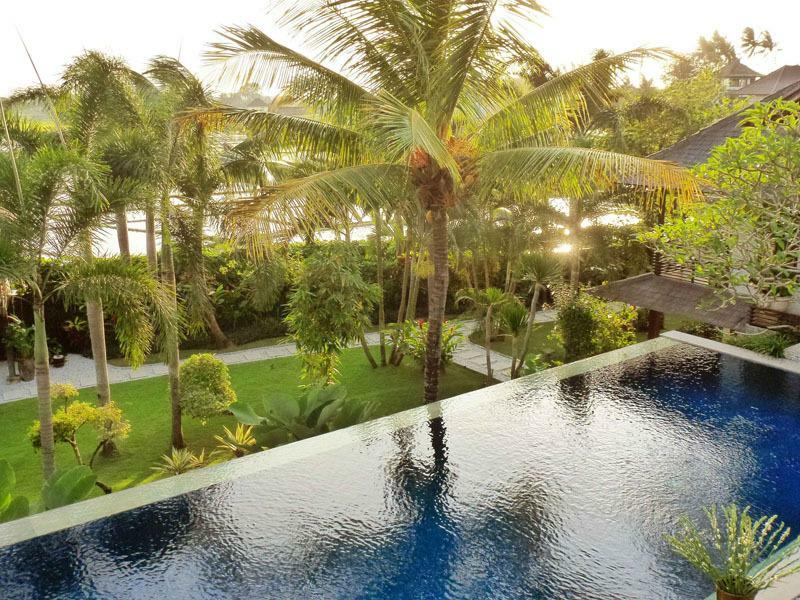 It's open-air living room lets guests stretch out in fan-cooled shade without losing any connection to the pool, the garden or Canggu's magnificent scenery beyond. By sundown, the room comes into its own with warmly textured lighting and a well bar that will bring all the guests together to kick off the evening's activities. The dining room, which can be as open to the elements as you wish, gives guests a dignified setting to complement our chef's culinary delights. There are balconies off three sides of the dining room, where guests like to congregate before and/or after each meal to sip cocktails and chat under the stars. This master bedroom suite features a wraparound balcony as well as a crow's nest terrace offering a glimpse of the Indian Ocean -- the perfect place to sip your morning coffee. The suite also includes a partially open garden-style bathroom and a TV nook. The room can be cooled with either air-conditioning or a ceiling fan. The second bedroom features a spacious, partially open bathroom and a balcony overlooking the villas zen-inspired fish pond. The room is cooled with air-conditioning. The third bedroom has a balcony overlooking a private corner of the gardens, a crow's nest terrace and a spacious, open-air bathroom. The room can be cooled with air-conditioning or ceiling fan. 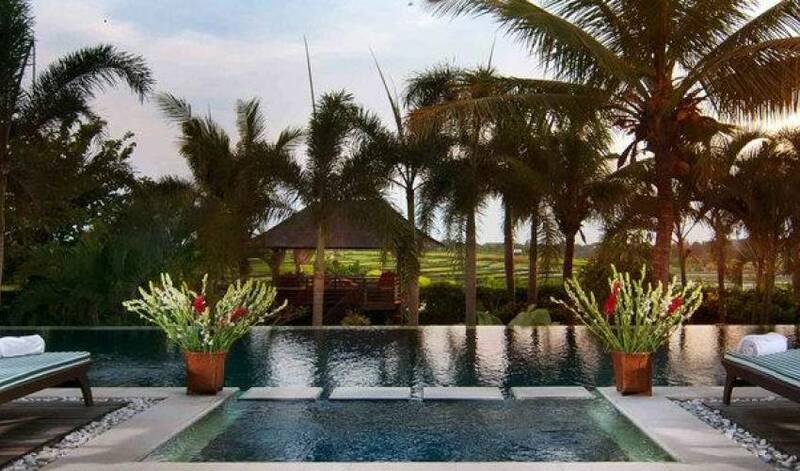 The fourth bedroom has a balcony with a 180-degree view of Canggu's rice fields and a crow's nest terrace overlooking the entire property as well as the surrounding terraced land. This bedroom features a spacious, garden-style bathroom. The room can be cooled with air-conditioning or ceiling fan. The TV room offers guests a cool and secluded break from the sunshine, appropriate for surfing the Internet, watching DVDs on our 42-inch plasma screen television or just stretching out with a novel. This room has a full bathroom, giving guests the option of turning it into a fifth bedroom, which our staff can do by setting up our double sofa bed. The fitness room is equipped with a Universal weight set and a static bike/cross trainer. 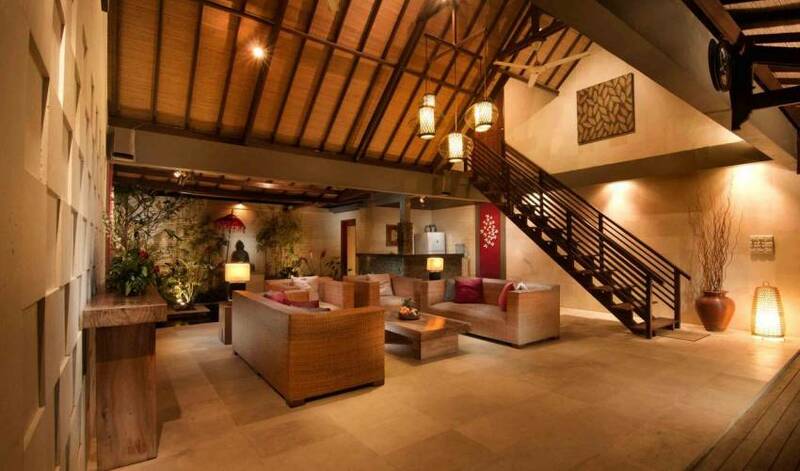 This room is also fitted out with air-conditioning and a bathroom with a shower. The kitchen is spacious and fully equipped with a four-burner stove, oven, microwave and large-capacity refrigerator/freezer. 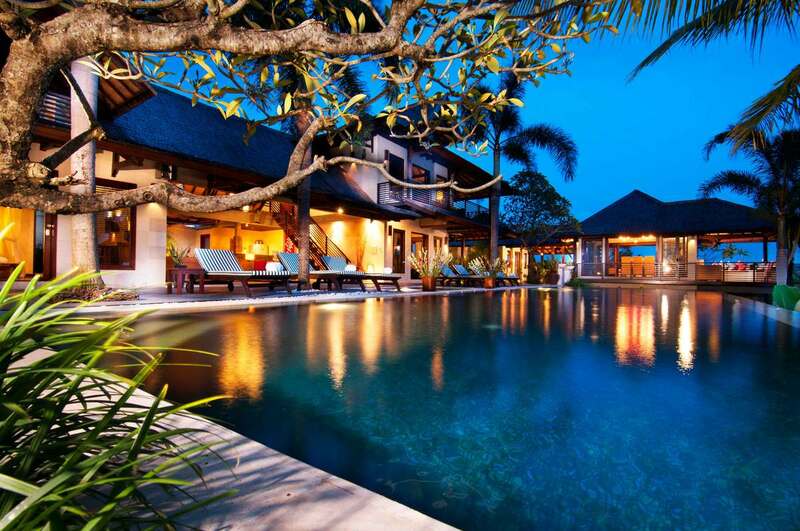 The property is approximately 5 minutes from Canggu surf beach, 15 minutes from Seminyak, 15 minutes drive from Bali Nirwana International Golf course, 5 minutes from Canggu International Club and 35 minutes from Bali's international airport. All bedrooms have balconies, air-conditioning, ceiling fans and partially open, landscaped bathrooms. 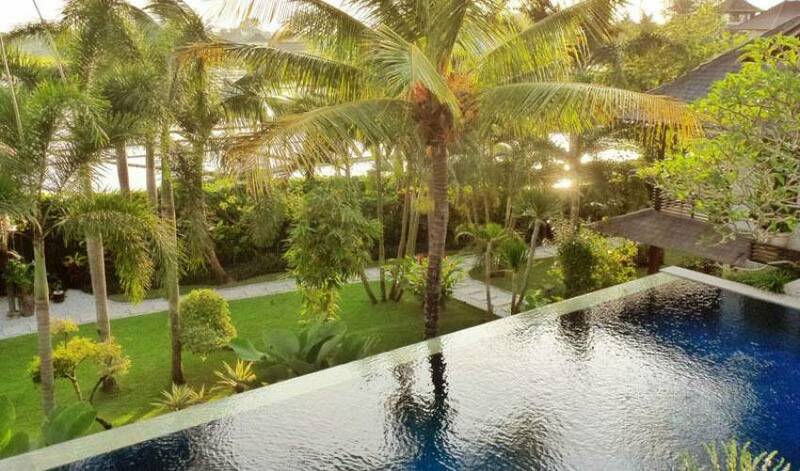 Guests can catch a glimpse of the Indian Ocean from the master bedroom's crow's nest terrace. The TV room/study is equipped with broadband and wireless connections, a 42-inch flat-screen TV with cable service and a DVD player. 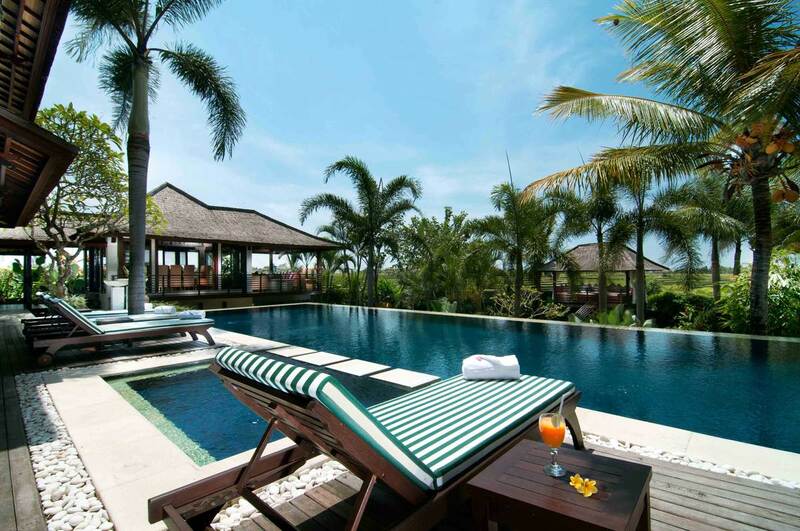 The 5-by-17 meter swimming pool is lined with azure-blue, Italian ceramic tile to keep the water cool. The air-conditioned fitness room is equipped with a universal set and static bike/cross trainer. Car rental with driver can be arranged prior or during your stay. Safety box in each bedroom. 24 hour doctor on call service. An additional tax of 5.0% will be applied. Thank you for your email. It was indeed a pleasure to meet you in person. 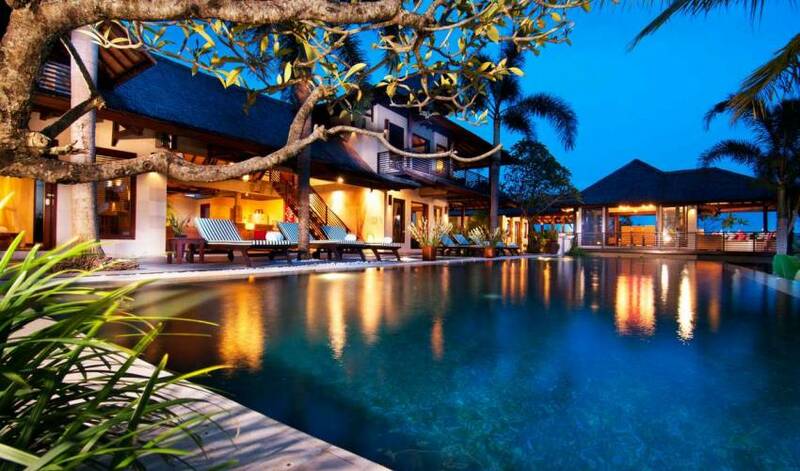 Our stay at villa Coraffan was perfect. 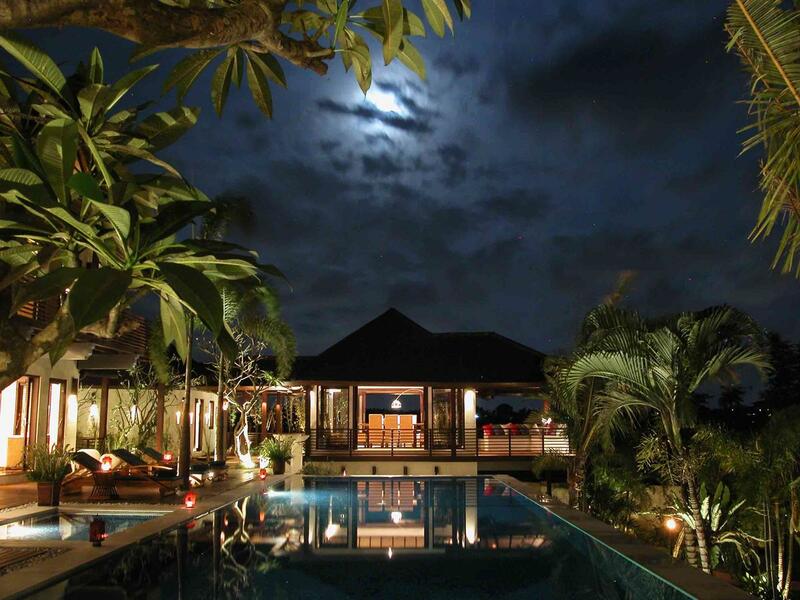 The staff, villa, the location, everyting was so great, and we truly hope to come back in the future. Again, a huge thank you to you for the organisation and the quality of our exchanges.